Automation is becoming increasingly critical in the implementation of safety strategies, both on and offshore. Here Eugene McCarthy highlight the latest projects involving automation solutions. The Azerbaijan International Operating Company (AIOC), operated by BP, has awarded Emerson Process Management a multi-million-dollar contract to automate a new offshore platform in the Azerbaijan sector of the Caspian Sea. The Chirag oil project, to be completed in 2013 and operated by BP Azerbaijan, will enable additional oil to be recovered from the Azeri-Chirag-Guneshli field. In addition to providing measurement instruments and asset management and automation systems to help BP operate the platform safely and efficiently (Fig.1), as main automation contractor Emerson will deliver project management services to ensure that the equipment is properly installed and integrated to meet technical, budget and schedule requirements. "We welcome the opportunity to work with BP Azerbaijan on this important project," said Steve Sonnenberg, president, Emerson Process Management. "We look forward to applying our automation technology, our experience in managing offshore projects, and our local support capabilities to help make the Chirag oil project a success." As part of the integrated front-end engineering and design (FEED) team, Emerson worked closely with BP for 18 months to define a digital automation solution to meet the project needs. Emerson will now be responsible for all automation engineering, acceptance testing, commissioning and configuration, and start-up and will also provide ongoing support of the automation system. Emerson’s PlantWeb digital plant architecture – including FOUNDATION fieldbus communications, digital automation systems, asset management software, and intelligent field devices – will provide process control and access to management information. 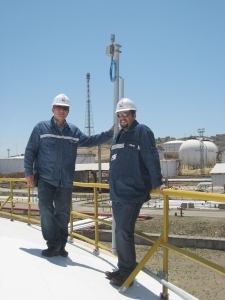 Its network of intelligent transmitters and valve positioners will also deliver continuous process and equipment health information to identify potential problems before they affect operations. These predictive capabilities will help to deliver high platform uptime. The architecture’s DeltaV digital automation system for process control, together with its DeltaV safety instrumented system (SIS) process safety system for process shutdown and fire-and-gas monitoring, will enable secure control of oil production on the platform. AMS Suite predictive maintenance software will provide online access to instrument and valve diagnostics and automatic documentation of field device maintenance information – all contributing to ongoing efficiency of platform operations and maintenance activities. AMS Suite will also be used to streamline device configuration and commissioning. Meanwhile Honeywell has been selected by Statoil, the international energy company headquartered in Norway, to deploy its Experion process knowledge system (PKS) and distributed system architecture (DSA) at Statoil’s Valemon platform in the North Sea. The DSA will allow Honeywell to integrate Experion with Statoil’s existing Kvitebjørn platform to enable remote command of the facility, aiming to reduce overall costs and lowering the safety risks associated with resource recovery. The Valemon field is located 160km west of the Norwegian coast and is one of Statoil’s largest development projects. The site contains recoverable reserves of 26b m3 of gas and 5m m3 of condensate, which equates to over one per cent of Norway’s gas reserves. Honeywell’s integrated control and safety system (ICSS) means work can be continuously controlled and the safety of subsea and topside operations monitored without the need for personnel on site. The entire operation can be operated remotely from the existing Kvitebjørn platform. Honeywell’s technology reduces the investments needed to achieve the goal of an unmanned platform as minor additional equipment and minimum engineering is required. The DSA will minimise production costs and increase safety for Statoil personnel, as well as reduce the risk of otherwise duplicated ICSS databases becoming inconsistent over time. Honeywell has also been selected by Bechtel International to design and implement automation and safety solutions for a new multi-train liquefied natural gas (LNG) facility under construction as part of the Australia Pacific LNG project in Queensland. The Australia Pacific LNG Project - a joint venture between Origin Energy, ConocoPhillips and Sinopec - will create a long-term industry utilising Australia Pacific LNG’s coal seam gas (CSG) resources in the Surat and Bowen basins. Bechtel selected Honeywell Process Solutions (HPS) to provide vital integrated control and safety systems (ICSS) at the new facility, which is designed to convert coals seam gas (CSG) to LNG. The project will produce CSG for commercial markets both locally and overseas and already supplies gas to power stations in Queensland, major industrial customers and homes and businesses in south east Queensland. The solution consists of components including Experion PKS and Safety Manager - which delivers enhanced safety assurance for operators who oversee industrial processes, and also includes Honeywell’s SIS, fire and gas systems (FGS), and Enterprise Building Integrator, which serves as a platform for both fire detection systems and security systems, integrating seamlessly with Experion PKS to provide operators with total situational awareness. “Honeywell solutions will provide Australia Pacific LNG with a safe and reliable system from day one,” said Frank Whitsura, vice president-HPS projects and automation solutions. “We design our systems to integrate seamlessly with other Honeywell and third-party products and solutions. This increases efficiency and reduces risk on a project so that it is completed on time and on-budget, which is the best possible outcome for all". Honeywell has also been named main electrical and instrumentation building contractor by the Hoang Long Joint Operating Company (HLJOC) for its H-04 wellhead platform in the Te Giac Trang (TGT) Field. Honeywell Process Solutions (HPS) was selected as main contractor for this project based on its strong engineering expertise and proven track record in meeting fast-track delivery schedules. In addition, HLJOC would gain value from an integrated Honeywell solution, managed by Honeywell’s integrated control and safety system, which consists of the Experion PKS and Safety Manager. Meanwhile Invensys Operations Management has signed a multi-year, multi-million dollar contract to deliver comprehensive software solutions and services for Shell. Text: Invensys Operations Management has issued the newest release of its SimSci-Esscor dynamic simulation software. Version 5.0 of the company’s DYNSIM software contains many additional features that expand its safety capabilities, improve its performance, lower total cost of ownership, extend usage and greatly reduce the time required to engineer and build process models. DYNSIM software is a rigorous, first-principle dynamic simulator that predicts the time-dependent behaviour of industrial processes. A well-designed DYNSIM model accurately depicts the same hydraulic, heat transfer and other equipment constraints as the actual plant and provides a single scalable application that can help companies reduce capital costs, improve plant design, trim commissioning time, increase asset availability and train and certify control room and field operators in a safe environment. Dynamic simulation studies that are commonly performed with DYNSIM software include distillation column relief load reduction, compressor start-up and surge analysis, de-pressuring analysis, refinery steam control and flare system analysis. Fig. 1. Emerson’s new systems will help BP to operate the AIOC platform more safely.